Journalists are running out of adjectives to describe Mexico’s recent economic performance: disappointing, slow, lackluster, stalled, etc. But they are not running out of people to cheerily forecast that improvement is right around the corner. This is the narrative pivot for all coverage on Mexico’s economy: things are not doing as well as hoped/forecast, but signs of improvement abound! It should come as no surprise that Mexico’s economy is underperforming – it has been doing so for quite some time, averaging just a 0.63 percent GDP growth rate between 1993 and 2014 (never exceeding 3 percent). But the flagging economic growth has had to compete with the perception and expectation of improvement generated by the Pacto por Mexico reform program. Although it’s unreasonable to expect structural reforms to produce measurable improvements over the short term, it seems such an expectation is not uncommon. So what is really wrong with Mexico’s economy? And will the reforms help? This post looks at informality, with some background on Mexico’s geographic disparities. In real estate, a ‘neighborhood price effect’ refers to the tendency of a single home’s value to be influenced by the value of surrounding homes. Sometimes, a relatively higher-value home is dragged down by surrounding lower-value homes, and other times a lower-value home is pulled up by surrounding higher-value homes. 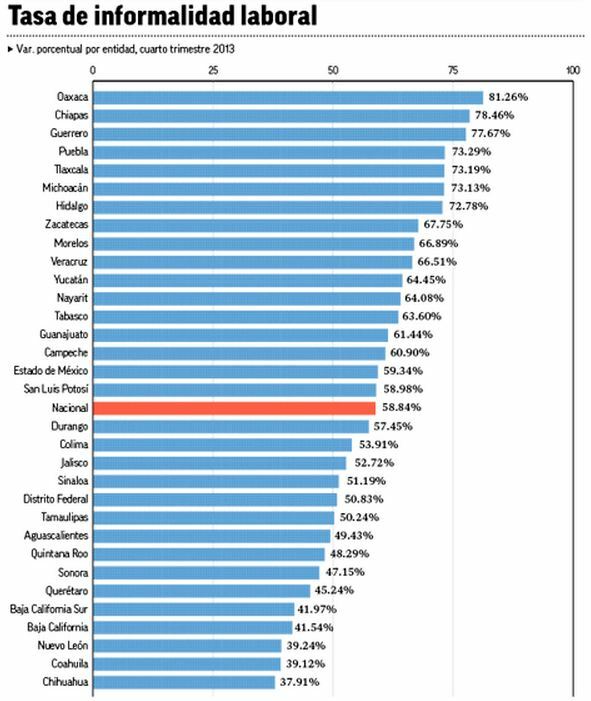 The disparity is significant: while Chiapas = El Salvador, DF = France. Numerically, DF’s USD 23,130 GDP per capita is more than 6x that of Chiapas (USD 3,657). In contrast, Washington, D.C.’s per capita income is only double that of Mississippi. So, imagine taking the differences between D.C. and Mississippi and magnifying them by 300 percent – that’s the reality of Mexico’s two neighborhoods. Keep in mind that, unlike the US comparison, the DF area accounts for 18 percent of Mexico’s population and 35 percent of its economic output; the D.C. area has 2 percent of the US population and 3 percent of its economic output. The central hypothesis of the McKinsey report is that Mexico’s developmental bifurcation originates from differences in productivity levels, with high-productivity enterprises creating high-wage jobs and low-productivity enterprises, low-wage jobs. I have a few reasons for being skeptical of this explanation. The report itself notes that wages at unproductive ‘traditional’ enterprises fell by 2.4 percent from 1999 to 2009, while wages in Mexico’s more productive, largest companies “have remained static, despite rapid advances in productivity.” But the report does not explain how boosting productivity will raise wages, if it has not done so for those already in high-productivity sectors. Sure, average wages at larger enterprises are higher than ‘traditional’ enterprises, but there are a list of reasons why – e.g., formal education/training – other than productivity. Also, if wages at high-productivity enterprises have been stagnant, wouldn’t pushing more workers into this segment put downward pressure on wages? Most important, productivity is defined in the report as output per worker – i.e., greater productivity = generating more output with less workers. Thus, dramatic increases in productivity at traditional enterprises would, at least initially, increase the unemployment rate, which would depress wages even further. That is not to say that the richer, urban centers are uniformly formal – DF is half formal and half informal – but the concentration of informality in certain regions suggests broader historical trends. Maybe poor physical and civil infrastructure in Chiapas make being a ‘formal’ business irrational – the costs exceed the benefits. 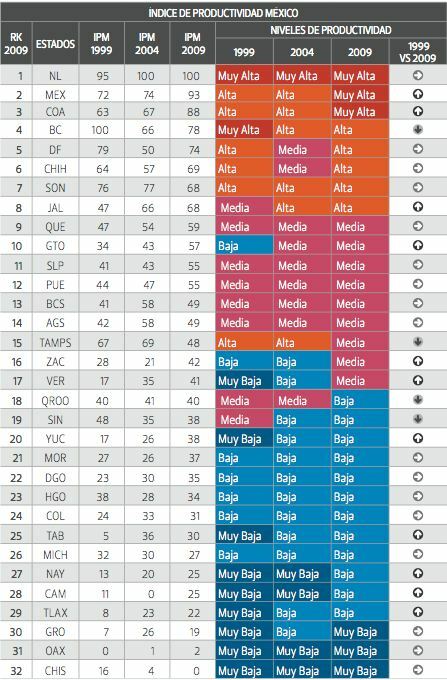 Also, the fix for informality in DF may differ from Chiapas. For example, Chiapas has the second-highest level of informality in Mexico, but is the fifth easiest state in which to do business, according to the World Bank (DF is dead last). Thus, while regulatory burdens may promote informality in DF, other factors may be at fault in Chiapas. Informality is an across-the-board constraint facing formal companies in Mexico – indeed, companies consider it the most significant business constraint, beating out taxes, financing, crime, and corruption. In principle, taxes, financing, and corruption would all diminish as constraints following a reduction in informality. More taxpaying enterprises would broaden the base and allow the Mexican government to ease the burden for all. Less cash-based enterprises means more bank customers, thereby increasing funds available for lending. And regulatory compliance eliminates the supply-side need for paying bribes. But it’s difficult to know in which direction causation flows – e.g., high levels of corruption create a competitive advantage for informal enterprises. Again, the causal link is not clear, and could easily flow either way. Still, it may be easier to craft government policies combating the characteristics listed above, rather than aiming at a nebulous concept like ‘informality’. There is a dissenting view on informality’s effect on economic growth. Some research has found that, in Mexico, informality is typically in the form of self-employment that provides the informal worker with a significant premium in earnings. And others have identified a positive correlation between informality and economic growth. The central question is the extent to which informality is the cause or effect of the harmful effects with which it is associated. In other words, but for its informality, would an informal business be more profitable? The answer is not clear. For example, research shows that, in addition to lower education levels, informal workers tend to be older as well. Thus, it is debatable whether formal enterprises are more productive because they are formal, or because they are more likely to employ younger, more highly educated workers. This ‘lawless cynicism’ has been a challenge facing Mexico since the colonial era, and has precluded the creation of a modern, effective state. Therefore, combating informality is an important component of Mexico’s efforts to modernize, even if the concrete economic benefits are unclear. Will the Reforms Reduce Informality? Financial Reform – if the financial reform succeeds in opening up access to credit for more Mexican businesses – particularly small businesses – it should discourage informality because banks will not lend to businesses without tax receipts. Telecom Reform – if the telecom reform succeeds in increasing access to high-speed internet at lower costs, it may lower informality by encouraging informal businesses to adopt technological improvements that could push them into the formal sector. Increased FDI in this sector should also have a negative impact on informality. Energy Reform – if the energy reform can lower energy costs for commercial consumers, it may reduce informality because, as McKinsey points out, many informal enterprises purchase electricity as individual consumers at lower, subsidized rates. Increased FDI in this sector should also have a negative impact on informality. Anticorruption Reform – the currently stalled anticorruption reform should inhibit informality. Increased anticorruption enforcement would raise the risk premium for corrupt officials, resulting in higher value bribe requests and higher costs for informal enterprises. As the costs of informality increase, more enterprises should be pushed into the formal sector. 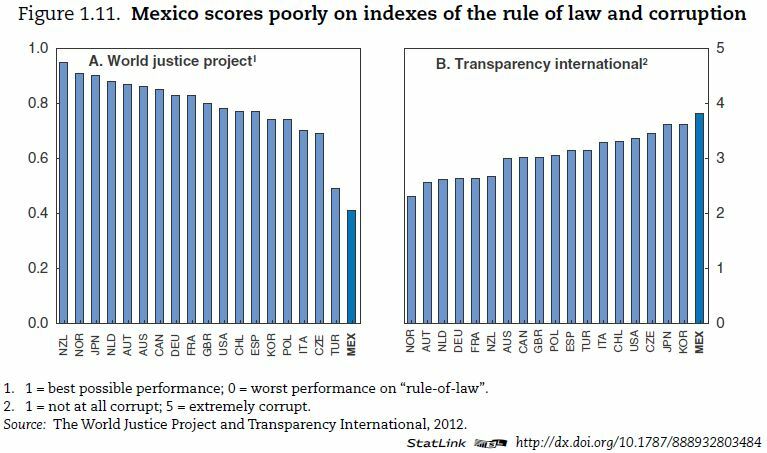 Collectively, the Pact for Mexico reforms seem likely to reduce – directly or indirectly – the level of informality in Mexico, although the delay in passing the Anticorruption Reform is concerning. Also, it is difficult to estimate the degree to which the reforms will have an impact on informality, and when this impact is likely to materialize. But, as McKinsey notes, the Mexican government already has a more effective tool at its disposal: enforcement agencies. Mexico is not known for sustained, predictable, and rational levels of enforcement. And if the government cannot rely on competent, professional, and neutral enforcers, the quality of the laws it passes does not matter. Thus, the Mexican government must increase both the likelihood and costs of enforcement – e.g., for tax fraud – against informal enterprises, thereby diminishing the benefits linked to informal practices. This entry was posted in corruption, economy, informality, legislation, Pact for Mexico, reform, rule of law, Uncategorized. Bookmark the permalink. What is wrong with Mexico’s economy actually has very little to do with its economy and everything to do with its political system. One cannot build a first-worl economy on the foundation of a third-world political system. Just because there are “elections” does not mean the people have any real choice. Just because there are media does not mean there is freedom of the press. In a first world country the political parties engage in public debate for the support of the people. In Mexico the major players of both parties meet secretly, strike a deal, and shove whatever they decide down the throats of the people. In the first world the people control the government, in Mexico the government controls the people. In the final analysis, the problems have nothing to do with economics and everything to do with a Medieval political system that is democratic in name only and in truth more like the fuedalism of the Middle Ages. The chance of the touted “big improvement” in the Mexican economy actually occuring is zero. The only rational economical advice one can give a Mexican is to leave. HIs only chances of real propsperity under the Mexican system are to become a narco or a politician, which are not as dissimilar as one might think: the one robs and cheats illegally, while the other does so legally.